Add your unique personal style and creative flair to your wardrobe by painting your own canvas runners. Artist Mel shows us how she paints on canvas runners using her favorite Princeton brushes. She uses the Mini-Detailer Series #3050 for her work because of the short, balanced handle and synthetic sable hair. Her brushes of choice are the 20/0 spotter for her fine detailed work, the 12/0 brush for tiny angles and the 10/0 for shading. 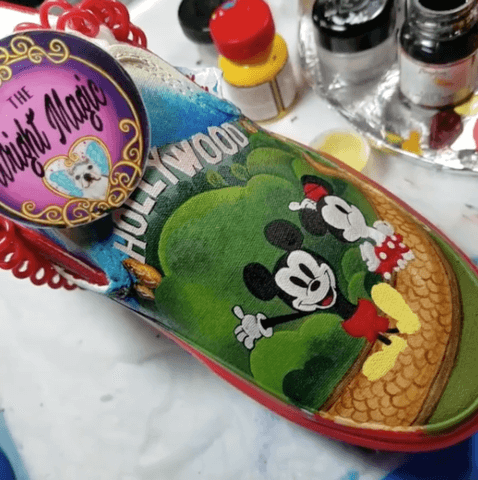 Watch Mel as she paints Mickey and Minnie Mouse on a pair of runners.